Remarkably, the Mets are still in the race for a wild card spot in the playoffs, after losing much of their starting roster. This includes their vaunted young pitching staff, of which currently only Noah Syndergaard remains in the rotation (albeit with a minor elbow bone spur, elevated pitch counts, and unable to hold runners on base), with Jacob De Grom on ice for the next week or two (at least) with forearm pain, Matz on the DL with shoulder pain and a bone spur on his elbow, Harvey recuperating from thoracic outlet surgery, and Zack Wheeler, future unknown, dealing with complications in his rehab from Tommy John last year. The last man standing? 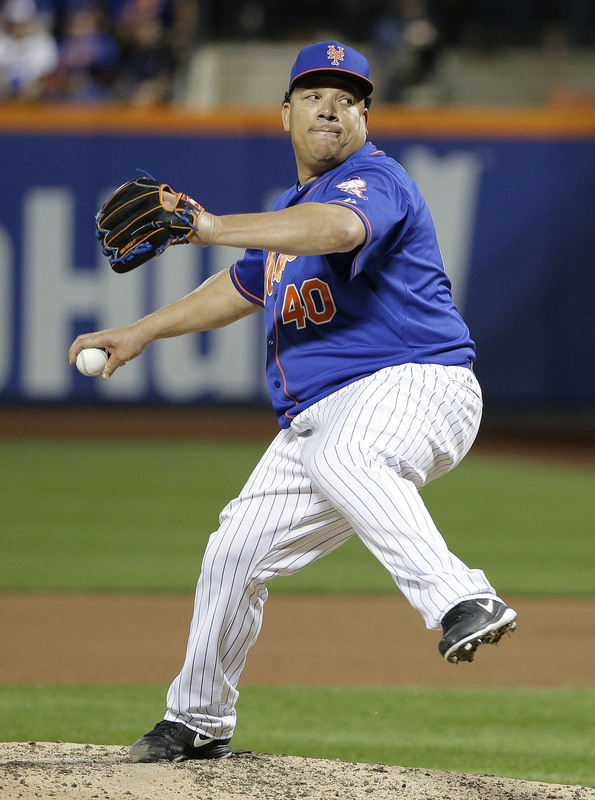 43 year old Bartolo Colon, who is fifth in wins since 2014—in the entire league. He has pitched in rotation in recent weeks with Seth Lugo, Robert Gsellman, and Rafael Montero, who have all had good results and in addition to level heads, have showed great promise. They have been a contrast to the no decisions and losses tallied up by De Grom and Syndergaard, who coming into the season, you'd be crazy to bet against. Jeurys Familia remains reliable as the closer, despite an errant pitch now and again, and the bullpen has been productive despite nailbiters by Robles and cartoon-like thinness by Jerry Blevins. (Not a fault, just sayin'.) Catcher Travis d'Arnaud flashes his bat power on occasion, and rotates duties with Rene Rivera, who has become Thor's personal catcher. And with Wright, Walker, and Lagares out for the season, and Duda out for a long spell but possibly able to return sometime this month, many bench players and minor league call-ups have filled in admirably. Kelly Johnson, sent to the Braves but reacquired, has shown power recently. James Loney has been solid at first base, if spotty with his bat. Wilmer Flores has played all over the diamond, and has been hitting to his potential, despite his weak running (today, he theoretically hit a double and triple but was thrown out both times in close plays; he also had a single). Also—he uses the Friends theme as walk-up music now. I mean, c'mon! 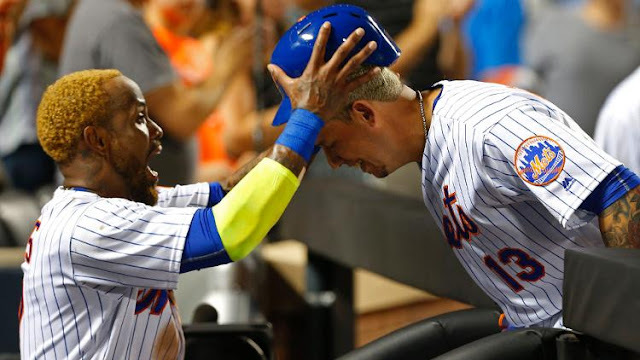 A welcome source of energy in the dugout has been Asdrubal Cabrera (shortstop), who instigated the ritual of batting helmet removal when another player enters the dugout after a home run; he is dynamic and spirited in a positive way. Another has been José Reyes, whose reacquisition was roundly questioned due to domestic abuse charges. If you were a Mets fan a decade ago, you were probably highly conflicted about this, as Reyes conjures fond memories of the team's anticipated rebirth in the 2000s when he joined the team with David Wright. In any case, over the years there has likely not been a player as fun to watch as Reyes, whose uniform is often dirt-covered after the first inning, showing his hustle. So far, so good and the energy he brings is undeniable. Back in the day, Reyes regularly hit triples from both sides of the plate and had special handshakes for just about every teammate. He had his own song—"Olé" x3, replaced with José—with which he was serenaded at each at-bat. But then he was traded to Miami, Colorado, and Toronto, which could not have suited him less both temperamentally and culturally. Rejoining the Mets this year, he seemed rejuvenated and buzzed with energy. He bleached his hair, a rally move that was repeated by Cabrera, and wears a canary warm-up sleeve, like Céspedes. He looks really happy. Ironically, Reyes is now most regular at third base, where David Wright has basically lived for a decade plus. It's a new position for Reyes, who has mostly handled it adeptly. And yet it marks the beginning of the post-Wright era, which fans have denied every since his back and neck issues have brought it into focus. At least he now sits in the dugout with his teammates during his rehab spell, rather than in the bullpen to avoid hit ball avoidance maneuvers that might harm his neck after surgery. He can be spotted joking around with De Grom, sharing a laugh with the underperforming Jay Bruce, or shaking hands with his mates onfield after a win, small reminders of his foundational presence in the club. The outfield has been a game of musical chairs. The stoic, mysterious, and powerful Céspedes, since his joining the team a year ago to help push the team to the world series, has now moved back to his regular position in left field, from center, to make it easier on his balky quad. Granderson has shifted to center, which requires more agility and range, a bit of a task since he's in the latter part of his career. Bruce, acquired for his RBI skills (which have yet to emerge in New York) now patrols right field. Alejandro de Aza pitches in at center, and utility man Kelly Johnson is used as needed. Michael Conforto, once the rock solid bat of the future, has yo-yoed between Las Vegas and New York, becoming somewhat lost with his bat, then hot, and hopefully will continue this current streak. 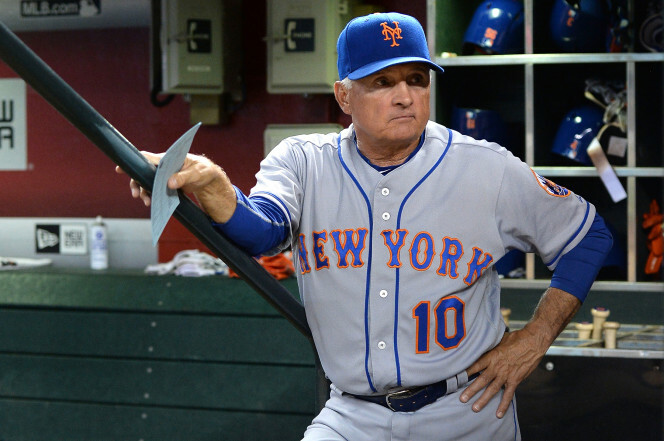 Matt Reynolds, Ty Kelly, Kevin Plawecki all wait on the bench for a chance to contribute. These days, we may not recognize the names that comprise the lineup. And yet over the past couple of weeks, this team—cobbled together by Alderson, motivated by Terry Collins—has had a terrific record. The 2015 world series roster is but a fond memory, with its indomitable pitching lineup and Daniel Murphy. But in a season with diminished expectations, there are many reasons to admire and root for the replacements even as we hope for the stars to return, healthy.